So much for the new, friendly Tiger Woods. As the field assembled for the 147th Open Championship here, that facade came crashing down as a video emerged of the 14-time major winner telling his rivals "if you get intimidated by me that's your own f------ issue". Since returning from his spinal-fusion operation last year, Woods has been depicted as more approachable to the other players; certainly to the young American champions such as Justin Thomas, Rickie Fowler and Patrick Reed, to whom he has apparently become something of a mentor. But although Woods has been accused of lacking the killer instinct of old this year – he has three top-sixes but, as yet, no victory – the footage of him conducting a master class to media and fans at his recent "TigerJam "charity event in Las Vegas highlights the "nasty" streak is still there as he searches for his first major in a decade. 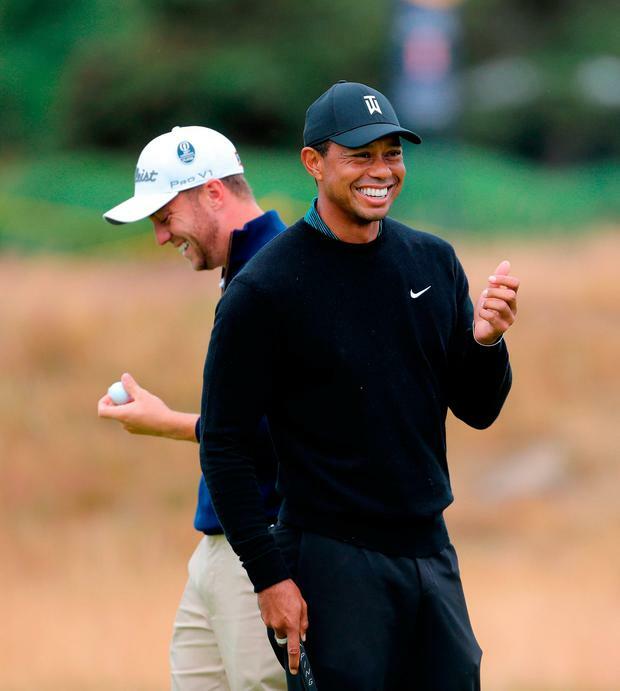 Russell Knox, the Scotsman, who has been drawn to play with Woods in the first two rounds, may be particularly interested to see the mischievous clip on social media. "I can't control you," Woods tells the audience. "The only thing I can control is I. Now, if I do this more efficiently than you, if you get intimidated, that's your own f------ issue." Woods will go out in his first Open for three years with Knox and Japan's Hideki Matsuyama at 3.21pm, the latest tee-time he has ever been given on a Thursday in the British major. By then, Carnoustie could be even faster than it is now. "If you get intimidated, that's your own f***ing issue"
The golfers woke up to rain here, but soon the sun was blazing down again and although the heat is not as intense as last week, the fairways are getting browner and the balls continue to travel absurd distances. Certainly, Rory McIlroy was surprised when he saw it for the first time. Of course, it was here in 2007 when the Ulsterman made his Open debut as an amateur but then this links was lush. "It's different," he said after 18 holes with a smile. And he confessed that so, too, will his game plan. Attack, attack, attack, seems to be his mantra. "I don't know if 15-under or 16-under is attainable but I could see it being the lowest score to win at Carnoustie [nine under par, by Tom Watson in 1975]," he said. "Because it is so baked out and burnt, there are patches of rough that are bad but for the large part, you're going to get away with it. As long as you avoid the fairway bunkers and give yourself some control of your ball, I think you could see some guys go low." McIlroy tried to take it cautiously at last month's US Open at Shinnecock Hills, but now realises that was a mistake as he shot 80, 76 to miss the cut. He had been at the Long Island course for 10 days before the major began and said by the time he started he was obsessed "by where I shouldn't hit it". This time he is intending to freewheel and rely on his instinct. Last week, he was at Wimbledon and watched friend Novak Djokovic on his way to winning his first grand slam in two years. McIlroy has not won a major in four years and can take plenty of inspiration from the Serb's resurgence. However, Padraig Harrington, who won here in 2007, does not feel the need for the four-time major winners – or anyone else for that matter – to panic. "Rory's obviously played well this year and yet seems to be getting a lot of press saying he's not playing so well. Clearly, his career is now solely based on how he does in the majors," he said. "But you're judging Rory over seven years [since he won his first major]. Give him another seven years and see if he's got eight in the bag. Are we disappointed with that then?" Harrington suggested experience would be vital on this course and pointed towards Woods's one-driver-all-week victory in 2006 at Hoylake – when it was similarly burned – as a potential blueprint. But the Irishman, who drove the ball 457 yards into the Barry Burn on the 18th on Saturday – also understands that aggression could be the wise play. "It's very difficult to play short all the time. If you keep playing short of the bunkers, the second shots are actually very long. If you lay up on, say, the fifth … yesterday I hit seven-iron off the tee to stay short of the bunker at 245 on the left, but like I then had 210 yards, which is an exceptionally long shot into that pin position off the back. "So, at that stage you're thinking to yourself, ‘well, eventually I'm going to have to grow up and hit the shots'. You're going to have to take some risks."